The Portrait: My Dearest Friend Virtual Book Tours Starts August 15th! My Dearest Friend Virtual Book Tours Starts August 15th! 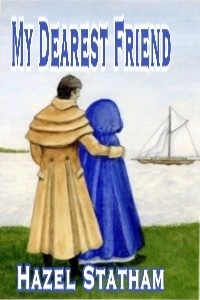 The My Dearest Friend Virtual Book Tour begins on Monday, August 15th! Robert Blake, Duke of Lear, is a man of intense emotions who loves deeply and protects fiercely. Devastated and wracked with guilt by the death of his younger brother, Stefan, in the Peninsular War, he readily agrees to aid Jane Chandler to bring her seriously wounded brother back from Portugal. Much against Jane’s wishes, he decides to accompany her and together they embark on the hazardous mission to retrieve the young soldier. However, the journey holds many revelations, not least of all the abiding friendship and growing love between the two travelers. That special love is put severely to the test by the treachery that awaits them upon their return to England, when a tenant of Jane’s former home invades their lives, maliciously creating jealousy and misunderstandings for his own nefarious reasons. Can their friendship and love conquer the emotions that threaten to tear them asunder?